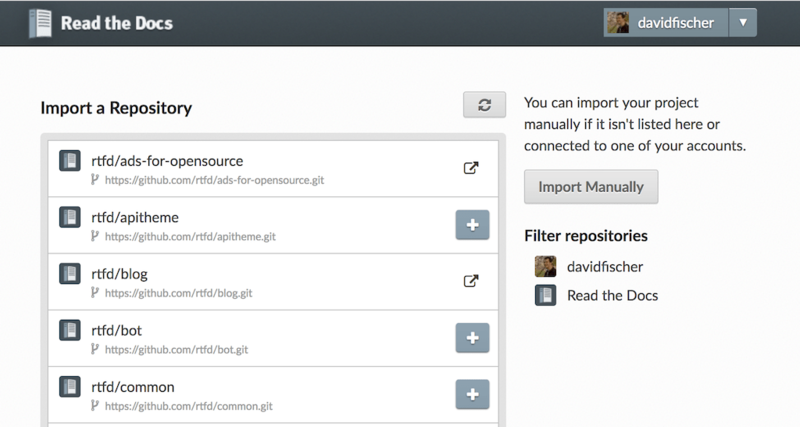 To import a documentation repository, visit your Read the Docs dashboard and click Import. If you have connected your Read the Docs account to GitHub, Bitbucket, or GitLab, you will see a list of your repositories that we are able to import. To import one of these projects, just click the import icon next to the repository you’d like to import. This will bring up a form that is already filled with your project’s information. Feel free to edit any of these properties, and then click Next to build your documentation. Add an optional homepage URL and some tags, and then click Next. Once your project is created, you’ll need to manually configure the repository webhook if you would like to have new changes trigger builds for your project on Read the Docs. Go to your project’s Integrations page to configure a new webhook, or see our steps for webhook creation for more information on this process. Within a few seconds of completing the import process, your code will automatically be fetched from your public repository, and the documentation will be built. Check out our Build Process page to learn more about how Read the Docs builds your docs, and to troubleshoot any issues that arise. Some documentation projects require additional configuration to build such as specifying a certain version of Python or installing additional dependencies. You can configure these settings in a readthedocs.yml file. See our Read the Docs YAML Config docs for more details. Read the Docs will host multiple versions of your code. You can read more about how to use this well on our Versions page. If you have any more trouble, don’t hesitate to reach out to us. The Support page has more information on getting in touch.